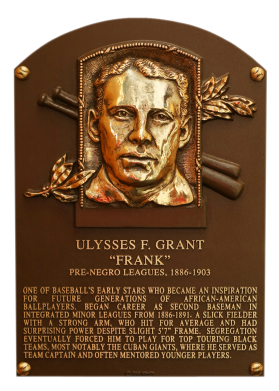 Often regarded as the greatest black ballplayer of the 19th century, Frank Grant starred for six years in integrated Minor Leagues before racism relegated him to touring black teams for the rest of his 20-year career. 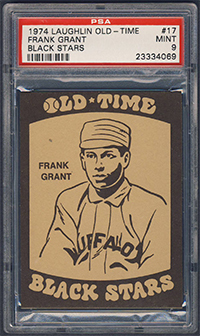 Grant played all positions but excelled at second base, where his speed, range and acrobatic plays impressed all observers. 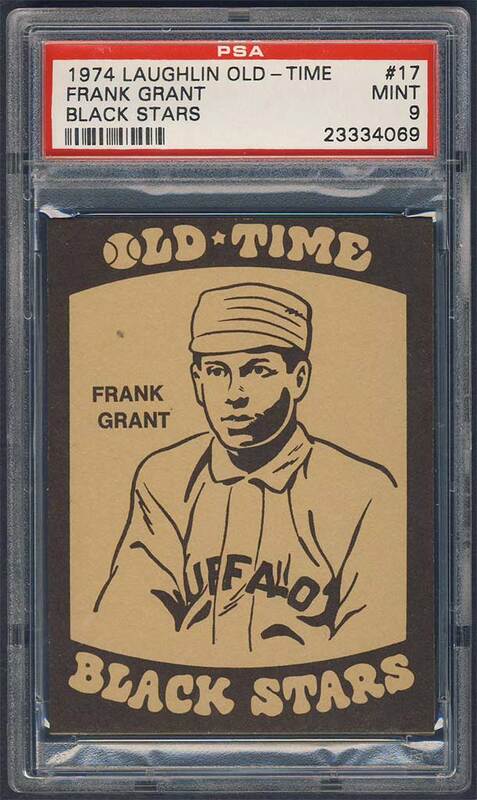 Despite standing only 5-foot-7, Grant was a solid hitter with good power, batting over .300 every year in the Minors, including three seasons with Buffalo of the International League. He anchored the all-black Cuban Giants of the 1890s before finishing his career in 1903. Comments: I searched eBay, shows, and the internet for this card for a little over a year and had no luck. Then on May 27th, 2011 I got lucky with a random Google search for "Frank Grant Laughlin". I found a website, from Columbia City Collectibles, with singles from the set listed for decent prices. The condition was as described and I was thrilled the hole was finally filled. UPDATE: On January 29th 2014, the card I purchased in May 2011 came back from PSA in a NM holder. A couple weeks earlier I won another example on eBay with hopes it would be an upgrade. When I look at the card it has a chance to grade a little better…we'll see. UPDATE: In March, 2014 a whole set of Laughlins showed up on eBay, each card sold separately. 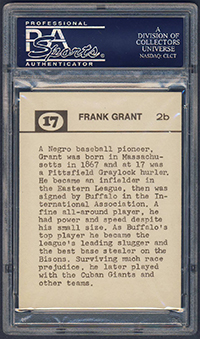 The grouping included PSA-graded NM-MT cards of Pete Hill and Frank Grant. I saved them in my Watchlist and entered a couple snipes. On the auction closing night I was able to monitor the sales and I entered a couple last second bids on both cards to save fees on the snipe service. I won both cards for a little less than my high bids (Grant - $80). I was extremely pleased to add the cards to my collection. UPDATE: I purchased a raw example of this card on eBay in January 2014. 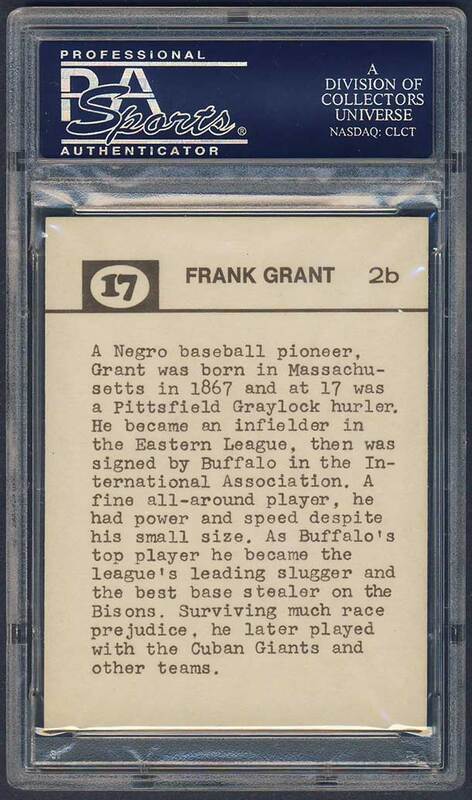 The card was sent off to PSA, along with 136 other sportscards, with hopes of scoring an upgrade. After three months of waiting the cards were returned to me on December 10th. I didn't open the box all at once to reveal the grades but had my kids randomly pick four cards to share with me on a daily basis to keep the excitement going. This is the best part of getting cards graded...what's it going to be? On Day 1, this one was pulled out of the box - a PSA 9. Not bad for a $17.50 investment - I'm thrilled!!! Just a few weeks earlier I bypassed an opportunity to purchase a PSA 8.5. It sold for $86. My gut said this card was going to grade out better. I was right. Click here for the full results of this submission.